The classes ccdc.molecule.Atom, ccdc.molecule.Bond and ccdc.molecule.Molecule are all stored in the ccdc.molecule module. However, you are unlikely to use these classes to create objects directly. You are much more likely to come across them after having read in a molecule from a file or after having accessed one from a database. Let us therefore import the ccdc.io module to allow us to get access to some molecules. In the CSD Python API, a molecule is not necessarily a single contiguous unit. It can contain several sub-molecules. In the CSD Python API we refer to these sub-molecules as components. The reason why this arises is that most molecular file formats allow the inclusion of molecular species which are not covalently bonded to each other to be included in the same entry. Below for example is a SMILES representation of the CSD structure ABEBUF. This “molecule” contains two components 5H,11H-Dibenzo(b,f)(1,5)diazocine-6,12-dione and pyridine. It is similarly possible to represent several molecules within single entries of mol2 and sdf files. In mol2 file format these are referred to as substructures. Let us illustrate this using the CSD structure ABEBUF. To get access to the molecule in this file we make use of a ccdc.io.MoleculeReader. This has implications for molecular properties, which are calculated using all the components within a molecule. Let us illustrate this using the molecular weight. Finally, it is worth noting that in many cases when dealing with molecules containing salts and solvents one is not particularly interested in the salts or solvents per se, but rather the larger organic molecule in the structure. This “heaviest” component can be accessed as illustrated below. There are some functions available for standardising and editing molecules. Let us start by illustrating how one can remove and add hydrogen atoms. To illustrate some of the more advanced molecule standardisation functions let us read in a PDB ligand (from the structure 1f0r), which has not got any hydrogen atoms added to it, in sdf file format. First of all if I am unsure about the bond typing I will need to assign this first. Note that this bond typing is based on the geometry of the molecule. By default, the ccdc.molecule.Molecule.assign_bond_types() function guesses the bond types of all bonds. However, if you had a molecule that only had the bond types set for some of the bonds and you had confidence in these then you could guess the bond types of only those bonds with “unknown” types by setting the parameter which to unknown . After the bond types have been assigned one can add hydrogen atoms to the molecule. Finally, let us come back to the concept of a molecule having multiple components. Suppose that we wanted to add the heaviest component from the ABEBUF molecule to the 1f0r ligand. This could be achieved with the ccdc.molecule.Molecule.add_molecule() function. 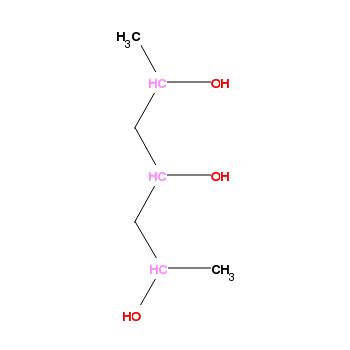 Operations which change the underlying molecule of an entry or a crystal, such as adding hydrogens, or assigning bond types will permanently affect the molecule. Any subsequent access of the molecule of an entry or crystal will return the mutated molecule. Reading the entry or crystal afresh from a database will, of course, return the original, unmutated molecule. Let us now have a look at the molecular properties available to us using the ABEBUF structure. Lists of the atoms and bonds in a molecule are accessed using the attributes with these names. We can also access the formal charge of the molecule as well as the molecular weight, the molecular volume (if all the atoms of the molecule have 3D coordinates) and the molecular formula. There is also a property which tells you whether or not the molecule is organic (as opposed to metal-organic). It is also worth mentioning that the molecule identifier and SMILES representation can be accessed through the molecule. CEMGUY 2D diagram, to exemplify ring analysis. The predicate ‘is_fully_conjugated’ is true for aromatic ring systems and for ring systems where every single bond is conjugated, for example the 5-membered ring in ‘POCTOS’. 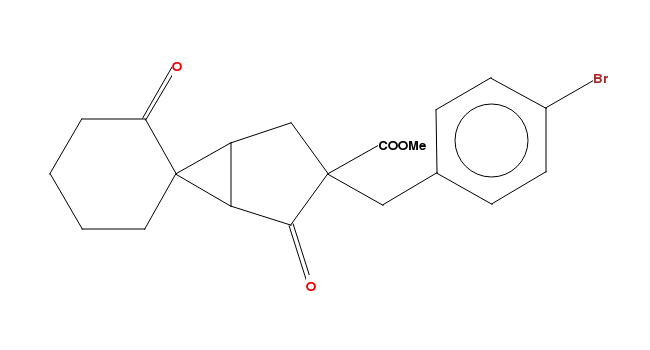 POCTOS 2D diagram to exemplify conjugated rings. We are not analysing the geometry of the bonded system in order to determine conjugation: this may produce false positives. It is sometimes useful to have access to a string representation of a molecule within a Python script, for example to convert a CCDC molecule into an RDKit molecule by making use of a SDF formatted string as an intermediate. The ccdc.molecule.Molecule.to_string() method is therefore provided for a molecule to be returned as a string in either ‘mol2’ or ‘sdf’ file format. Similarly the ccdc.molecule.Molecule.from_string() method reads in a molecule from a ‘mol2’, ‘sdf’, ‘mol’, or ‘cif’ formatted string. The format parameter may be one of ‘mol2’, ‘sdf’, ‘mol’, or ‘cif’. A SMILES representation of the molecule is accessible through its ccdc.molecule.Molecule.smiles attribute. Close contacts, pairs of atoms closer than the sum of there Van der Waals radii, can be identified within a molecule. A contact has a property, ccdc.molecule.Contact.is_in_line_of_sight which will determine whether the atoms constituting the contact are visible from each other, or whether the contact is occluded by another atom of the molecule. 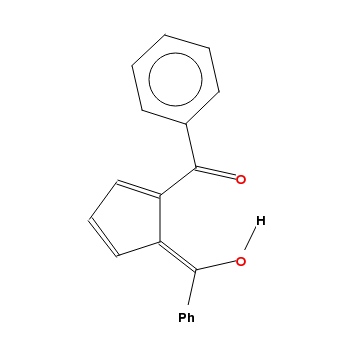 This property is also implemented for a molecule’s hydrogen bonds, where the test is whether the hydrogen, if present, is occluded from the acceptor, or if the hydrogen is not present, whether the donor is occluded from the acceptor. The hydrogen bonds of the molecule may be obtained by the method ccdc.molecule.Molecule.hbonds(). The default constructed ccdc.molecule.Molecule.HBondCriterion does not require the hydrogens to be present, and in consequence both potential hydrogen bonds are detected. Note that the hydrogen bonds returned do not contain a hydrogen even though it is present in one of the hydrogen bonds. In consequence the ccdc.molecule.Molecule.HBond.length and ccdc.molecule.Molecule.HBond.angle are both None. Let us have a look at the atomic properties available to us using the ABEBUF structure. To do this we will need an atom. Let us just use the first one in the molecule. We can identify the atom using the index and/or the label. Atoms may have residue labels where these have been set in the molecule. There is a convenience method, ccdc.molecule.Molecule.set_residue_by_component() which sets the residue labels of disconnected components of the molecule to distinct values. To understand the chemistry we can inspect the atomic symbol and the formal charge. There is a property to inspect the partial charge of an atom, where available, and a method of the molecule to calculate partial charges. The method used is that of Gasteiger J.; Marsili M., Tetrahedron 36 (22) 3219-3228 1980. This is comparatively fast, and has good convergence properties, but is applicable only to organic molecules. Accordingly a bool is returned indicating the success of failure of the assignment. If a formal charge is explicitly set for any atom of the molecule, the partial charges will be invalid and so will be removed. Furthermore, there are also descriptors to check whether or not an atom is a metal, a hydrogen bond donor, a hydrogen bond acceptor and whether or not it is in a ring system. Clearly, we also have access to the atomic coordinates. The coordinates returned by ccdc.molecule.Atom.coordinates() is in orthogonal space. If the atom has no coordinates, None will be returned. Similarly fractional_coordinates will return None if no coordinate information is available. There are other, more specialised data available: please see the documentation of ccdc.molecule.Atom.DisplacementParameters for more details. HPTROL 2D diagram, to exemplify para-chiral centres. Here the central C4 atom is para-chiral since the atoms C2 and C6 have opposite chirality. Let us have a look at the bond properties available to us using the ABEBUF structure. To do this we will need a bond. Let us just use the first one in the molecule. To identify the bond we can access the two atoms connected by it. To understand the chemistry we can check the bond type. Note that we can also use integers to check the type of a bond. The integers used to represent bond types according to the CSD convention are. It is also possible to check whether or not a bond is cyclic and/or rotatable. © Copyright 2019, Cambridge Crystallographic Data Centre.